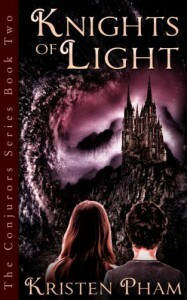 Knights of the Light is the second installment to the Conjurors Series, the story picks up quickly where it left off in The Society of Imaginary Friends. There isn't any waffling or events that happened we're automatically suppose to know about, which is nice, it's a smooth transition between books. Valerie is still our main heroine, and she's grown even more in this book. She still doesn't want to be a leader an struggles with it, but she's definitely coming into her own. I feel she's at a point where she's just accepting it and ready to do what's necessary. Valerie's now torn between loving two men, and who she want's to be with. The romance is sweet and light in this book, it's not creepy or above age level, it's pretty realistic for their ages. The writing was excellent, the plot was strong and it was a quick paced journey filled with twists and turns. Ms. Pham does a spectacular job making her characters feel real and sincere, you feel for them, whether they're good or bad. I think it's hard to be able to show why a main character does what he/she does, let alone a bad guy or side character and still make a big impact with it. This is definitely a great book for the teenage crowd and adults who want a fun fantasy journey. I enjoyed the book from start to finish, and would definitely recommend this book:).